Ever wondered how How to Increase Your Instagram Followers by 7X in 30 Days?? As the cliché goes, content is king — especially on Instagram, where every picture you scroll past is gorgeous. As Chafkin quickly learned, gorgeous takes a lot of preparation and a team of professionals. This is how you do it. 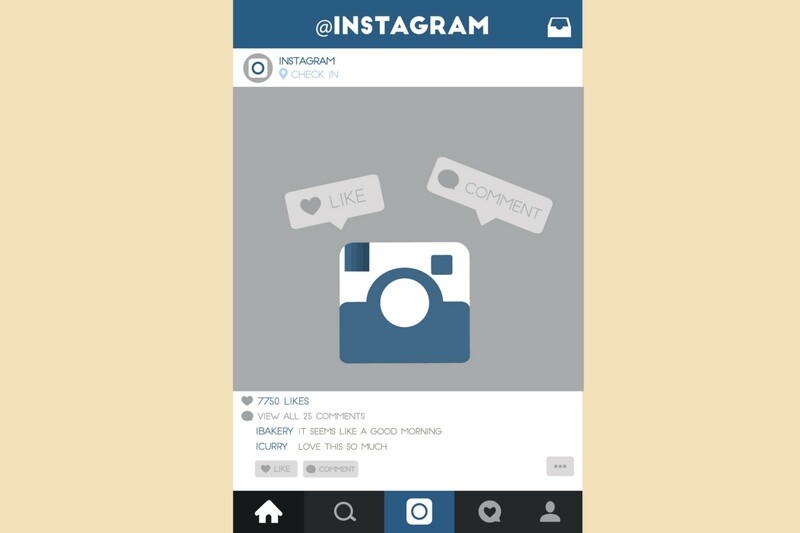 First, understand the type of content that does well on Instagram. Study accounts that your target audience follows. Take note of which types of photos garner the most engagement, and look for key themes. 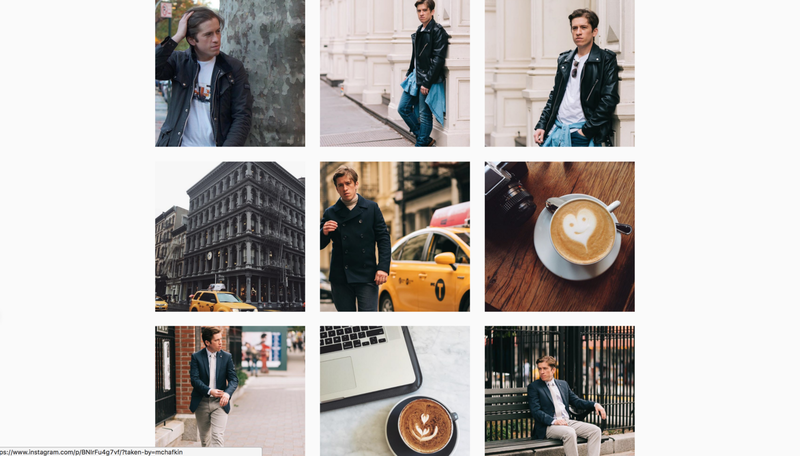 For example, if you want to be an Instagram celebrity, like Chafkin, study the profiles of other influencers. You’ll quickly learn that landscapes, people, food, and puppies are crucial. If you’re a business, laptops, beautiful quotes, offices, and gorgeous products work well. Think of your profile as a glossy lifestyle magazine that people want to flip through. Second, create a ton of content ahead of time. Two weeks before Chafkin’s one-month experiment began, he spent two days producing content. Saynt talked brands into lending clothes and two experts into styling his ensembles. Then, he went to the Socialyte office with 18 different outfits to meet a photographer for the 12-hour photoshoot. Businesses can do the same thing. Hire a professional photographer, or even just someone who’s good with a camera. Have him or her walk around the office taking Instagram-worthy environmental and candid shots. Another way to secure gorgeous photos: Buy them from a stock photographer. Saynt introduced Chafkin to a photographer who has an endless supply of “perfectly framed lattes, hipster hotel lobbies, and urban sunsets.” He purchased 20 for $400, bringing his total photography tab to $2,000. You surely can find a cheaper source. Try Thumbtack or the local journalism school, which probably has loads of young and eager photojournalists. While the natural next step seems to be posting all this amazing content, it’s not, so hold that thought. So you have all this amazing content, but no followers to share it with. The question becomes: How the hell does my profile get discovered? The answer: hashtags. For any newbies out there, a hashtag is a keyword with a pound sign in front it, and it helps users searching for specific types of photos to find you. Example: #liveauthentic, which has been used more than 14 million times in Instagram. Chafkin’s advisor recommended he include 20 hashtags per post. That’s a lot and it can junk up a post. Fortunately, there are a couple of hacks. Chafkin hid his hashtags below a series of line breaks. You can do that, or you can put them in a single long comment after your post. How do you come up with the hashtags? Use an app like Focalmark. You input a couple of variables about each shot and, based on those inputs, the app churns out a list of hashtags. 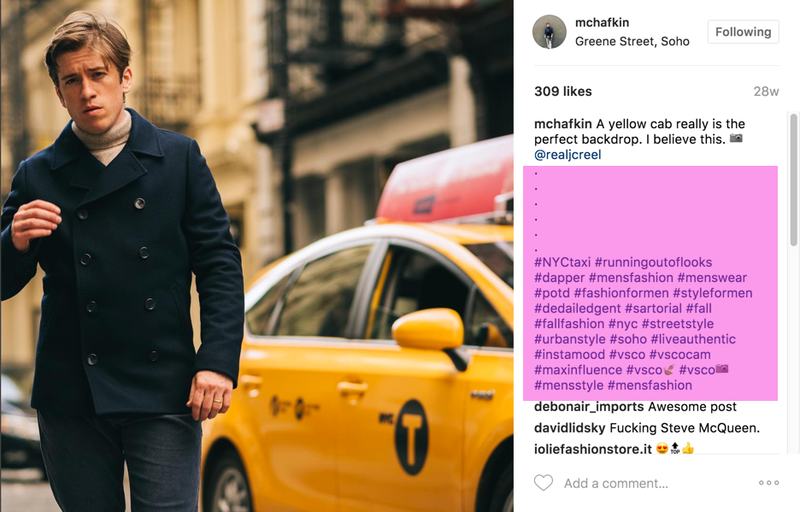 For example, Chafkin told Focalmark that one shot was a portrait, containing menswear, in New York City. Based on this input, Focalmark suggested #menwithclass, #mensfashion, #agameofportraits, #hypebeast, #featuredpalette, #makeportraits, #humaneffect, #themanity, and #liveauthentic. Now it’s time to schedule your content. As I mentioned earlier, Instagram is like a photo album you flip through. If you post a bunch of photos at once, it breaks the organic vibe and spams users’ feeds. Instead, use a tool like Later. Schedule three posts per day at times when your followers are most active. You can discover those times by using a tool like Iconosquare. A surefire way to get more Instagram followers is to follow, like, and comment on other people’s stuff. You can do this manually or with a bot. Because you want to gain followers fast, and because you can only do so much manually, bots give you the most engagement bang for your buck. Chafkin went with Instagress (which appears to have shut down). For $10 per month, the bot likes and comments on posts with the hashtags you specify. It also avoids posts with specific hashtags you choose. In addition to choosing hashtags, you must write a few canned comments that Instagress will randomly use. In a typical day, Chafkin’s bot liked 900 photos and made 240 comments. By the end of the month, he’d liked 28,503 posts and commented 7,171 times. Marketing guru Neil Patel uses a similar strategy and has found that for every 100 likes, he receives 6.1 more followers. Tip: Have the bot engage with your competitors’ followers. You can also buy followers. Chafkin purchased his from a site called Social Media Combo, which offers high-quality followers. Prices range from $15 for 500 to $160 for 5,000. He stuck with the $15 package. Suddenly, his account skyrocketed from 885 followers to around 1,400 in a few hours. While Instagram quickly removed a bunch of his new, fake followers, he was adding enough real followers to make it worth it. FollowerCheck said he had 1,168 real followers at the end of the month-long experiment. 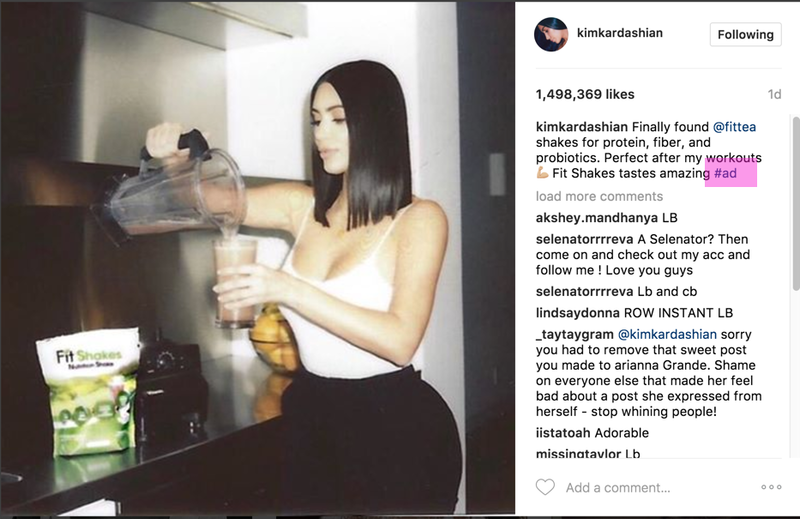 If you pay attention to influencers’ captions, you’ll notice hashtags like #sp or #ad. This means someone paid to the sponsor the post to reach that person’s audiences. To get an idea for prices, check out the image below from Bloomberg. Don’t fret if you don’t have the budget to become the next Kim Kardashian. The bigger you grow, the lower your engagement. For unpaid posts, Instagram influencers with fewer than 1,000 followers have a like rate of about 8 percent. The rate drops to 4 percent between 1,000 and 10,000 followers, and it goes down from there as followers increase. Influencers with 10,000 to 100,000 followers see a 2.4 percent like rate compared to 1.7 percent for those with 1 million to 10 million. The pattern holds true for comments. After you decide on your budget range, you can start searching for the right influencers for you. Look at who follows you already. It’s a lot easier to convince someone who is already a fan to do a sponsored post because the partnership will be more authentic. Say you’re a restaurant owner. First, scroll through your followers, and look for people with 1,000 to 10,000 followers. As you scroll, you notice a bartender with 7,000 followers. You check out his feed and notice he loves to post food and drinks. This person is a prime target. You offer him X amount of free food and drinks in exchange for a few posts of his experience at your restaurant. Next, search for specific hashtags. If you specialize in farm to table, #food is bad but #organicfood is perfect. When you do your search, Instagram sorts the results with the posts with the most likes on top. Click on the image to check out the poster’s profile. Once you start building those relationships, other influencers will start reaching out to you, enabling you to generate some extra cash on the side. Turns out, Saynt knew what he was talking about. With his help, Chafkin went from 212 to 1,400 followers in one month and today has over 4,500. That said, Vaynerchuk wasn’t totally wrong. As Chafkin quickly found out, it takes a lot of work to be popular on Instagram, which is why everyone isn’t instafamous. So, these are the ideas and guidelines that will help you Increase Followers on Instagram. Which one major point are you going to focus on first? Don’t forget to mention them in the comments below. Also check 10 Instagram Growth Tactics – 2018 to Increase Followers on Instagram.